The Point provides an unforgettable getaway. 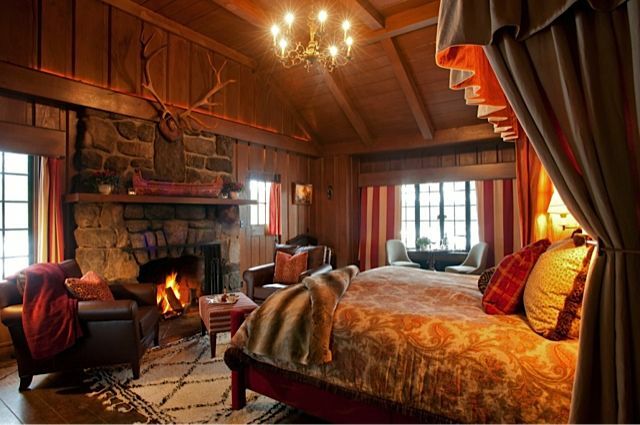 This sumptuous, rustic lodge, set in the Adirondack Mountains, is an exclusive Relais & Châteaux hotel in New York State, with only 11 accommodations. The Point wins constant awards and accolades, and has a very high repeat guest rate. It is extremely high-end, exclusive, and pricey. Its room rate -- includes everything: room, food, drink, activities, gratuities. The Point is one of the most upscale all-inclusive hotels in existence. The Point is a bucket list experience where guests live like Rockefellers. No surprise: the property was once the upstate getaway of tycoon William Avery Rockefeller. He founded the Standard Oil Company with his brother John D., and ranks as one of the richest Americans ever. In the late 1800s and early 1900s, America's uncrowned kings were its "robber baron" families, industrial and financial magnates in the days before income taxes. These potentates lived like kings in their many homes. One was likely to be a Great Camp, a lakeside mountain lodge where they (and their cousins and servants) could get away for the weekend or summer to live in splendor amidst nature. The lake-dotted Adirondacks Mountains, just a few hours north of New York City, was a favorite Great Camp setting for these dynasties. The Point, perched on wooded Saranac Lake, was the Great Camp of William Avery Rockefeller and his family. The Rockefeller estate's wood-and-stone main building, the "Great House," is now the center of The Point. It contains four of the inn's 11 rambling guest rooms; plus the hunting-lodge-style Great Hall for dining and lounging alongside a massive stone fireplace; a bar; and the kitchen. The estate's Boathouse is still used for its original purpose, and houses The Point's most-requested (and most expensive) room (photo on next slide). Two additional buildings shelter the remainder of The Point's lovely accommodations. The Point's look is turn-of-the-century – the dawn of the 20th century, when Rockefellers ruled. The Point is built of Adirondack wood and stone, with soaring vaulted ceilings. Massive river-rock fireplaces are ubiquitous, and mounted hunting trophies dot the timbered walls. (Animal lovers, be prepared). Rooms at The Point are richly furnished with Persian rugs, overstuffed couches, oil paintings, antique lamps, and mesmerizing Upper Saranac Lake views. The Point is so cozy and convivial, it makes a boutique hotel look impersonal. This is a luxury inn with only 11 rooms. And they're all different. I stayed in Morningside, one of four rooms in the lakeside Great Lodge. Morningside is spacious, with burnished golden wood walls and tall windows on three sides. A seating area surrounds the fireplace, and a small dining table overlooking of the lake. The bed is bigger than a king, with pillowy linens you can get lost in. The entrance foyer contains a capacious closet. Morningside's vintage black-and-white bathroom is a retro marvel. It offers a huge claw-footed tub; a separate tiled rainfall shower; a handsome porcelain pedestal sink; and cabinets filled with good-sized lotions and potions (including lip balm) from Kiehl's pharmacy in Manhattan. Dining is a highlight of The Point, as is true of all Relais & Châteaux hotels (this is a French association, after all). All food and drink is included in The Point's room rate. This food and drink is not only extremely high-end, it is never-ending. Guests should come to The Point ready for a steady stream of rich, delicious, gourmet dining. Luxury ingredients like foie gras, truffles, and caviar are served with abandon. Can you deal? This hotel is deeply committed to its "F&B" (food and beverage). The Point's spacious kitchen and large staff would do justice to a large hotel, but their output is created for only 11 rooms. All F&B is overseen by executive chef Lois Leperlier and his team. Chef Loic is a native of France with a CV of top international kitchen jobs. This gifted, committed chef aces the difficult trick of serving deluxe gourmet fare that is as hearty as it is upper-crust. Everything served is house-made, of supreme quality, cooked expertly to order, and served with consummate flair. Dining-room service at The Point is the equal of any acclaimed culinary restaurant. Only here, you can have seconds (or thirds). Guests' tastes, preferences, and special diets are honored and made the best of. A personal note: as a dining critic, I have reviewed hundreds of restaurants in and near New York City. And I'd rank The Point's dining up with the city's most elite restaurants. Breakfast, like all meals at The Point, is cooked to order. Dinner is a grand occasion at The Point. Just as it was when The Point was a Rockefeller estate, Saturday evening dining is black-tie. Make that black-tie optional: formal wear is requested, but not required. The Point's estate rambles over 75 magnificent acres along Upper Saranac Lake in the Adirondack Mountains of upstate New York. In this anointed spot, there's a plethora of outdoorsy things to do and enjoy. The Point makes it easy to enjoy the property. It is fully stocked with athletic equipment and outdoor clothing and gear. You don't need to bring even your hiking boots. Yet one more way that The Point distinguishes itself is in its refined management and service. This is no-doubt-about-it five-star hotel service. At The Point, the main event is the guests, and not the hotel's legend and aura. The Point does not host youngsters under 18 unless the entire property is booked for a family or corporate event. But The Point embraces pets with open...paws. This is a truly pet-friendly hotel. Your lucky dog is warmly invited, and will be pampered along with you, at no extra charges. Not just canines can RSVP to The Point's pet party. Cats are welcome, too. My Blue Point Siamese, Mingus (above), thoroughly relished his guest experience at The Point. He was welcomed with a tray of gourmet feline food, treats, and crystal-clear local Saratoga water. He snoozed before the fire in our room, Morningside, and on its impossibly plush bed. Mingus was one very happy camper in this Adirondacks Great Camp. Is The Point Resort Your Style? No matter how deluxe a hotel may be, it can't be for everyone. Here's a quiz to give you an idea whether you'd like staying at The Point. Will You Fall in love with The Point? As is common in the travel industry, the Expert was provided with a complimentary stay for the purpose of describing the hotel. For more info, see our site's Ethics Policy.